Carly Rae Jepsen has praised Sia for being "so humble and rad" after she collaborated with the 'Elastic Heart' singer on her upcoming album. The 'Call Me Maybe' hitmaker is a big fan of the Australian singer/songwriter and was desperate to have her on her her new LP 'E·MO·TION'. Carly insists it was great to work with Sia and she is very excited about the song they have created together. 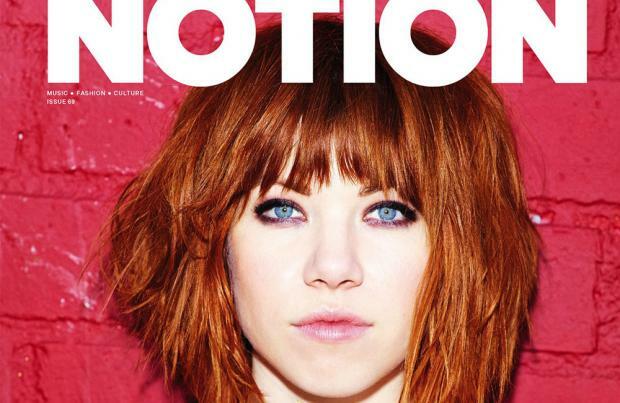 Speaking in the latest issue of Notion magazine - on which she is the cover star - Carly said: "Sia is so humble and rad ... I was so nervous that day." Sia is among a host of big names that feature on the LP, with Carly's other collaborators including "Greg Kurstin, The Cardigans's Peter Svensson, Dev Hynes, Arial Rechtshaid, Tegan & Sara, Jack Antonoff and Vampire Weekend's Rostam Batmanglij". Carly is really pleased with the track 'All That' which she recorded with Dev because it represents a departure from her usual sound. Discussing the song, she said: "It's got an amazing Prince-y vibe to it, it's very evocative, a total slow jam." Carly's first single from the album, 'I Really Like You', is out on April 26 and the video features a cameo appearance from Tom Hanks, and she admits she wanted the Oscar winner to be in it so it wouldn't become too "sickly sweet". She said: "Look, I'm a cheesy, nerdy Broadway girl at heart. It's a very flirtatious, adorable song but ... we felt like if we had a sickly sweet video it would just overkill ... My favourite bit (video) is where we sent 'running guy emoji', 'tree emoji' and 'running guy emoji' to Tom Hanks. Run, Forest, Run!"